At the Supper of the Lamb: A Pastoral and Theological Commentary on the Mass walks you through each part of the Mass. Its structure follows the Order of Mass in the third edition of the Roman Missal. This book is an invitation to worship, a call to new intention, and a deeper awareness of the privilege we share to be invited to the supper of the Lamb. Includes texts from the revised translation! "A worthy successor to Fr. 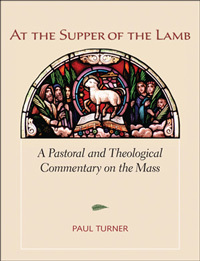 Turner's Let Us Pray: A Guide to the Rubrics of Sunday Mass, At the Supper of the Lamb: A Pastoral and Theological Commentary is a guide to liturgical mystagogy from a wise and seasoned pastor and scholar. Always grounded in the revised English-language text of the Roman Rite Order of Mass in its"ordinary form," the author offers a succinct commentary on each element, combining historical data with theological insight. What makes the work so helpful, however, are the questions for reflection and discussion appended to the background Fr.Turner offers, questions that gently but forcefully invite readers to become attentive to what is said and done during Mass in order to deeper their understanding of and prayer during Mass. I highly recommend this little book as a wonderful vehicle to develop the full, conscious and active engagement with the liturgy that is the right and duty of all the baptized." Paul Turner holds a doctorate in sacred theology from Sant’Anselmo in Rome. He is a priest of the diocese of Kansas City-St. Joseph and the pastor of St. Munchin parish in Cameron, MO. He is a former president of the North American Academy of Liturgy and a team member for the North American Forum on the Catechumenate. He serves as a facilitator for the International Committee on English in the Liturgy.